Page Street Publishing, 9781624145544, 192pp. With a focus on vibrant, modern flavors and a gorgeous full page photo for each recipe, the Mediterranean diet has never been easier or more delicious! Samantha Ferraro’s fresh and simple dishes make it easy to eat healthy food throughout the week. Enjoy all of the amazing benefits of the Mediterranean diet, no matter how busy your schedule. Lean proteins, bright produce and heart-healthy oil make for light meals full of zesty, aromatic spices that leave you nourished and satisfied. Try One-Pot Paprika Chicken with Olives and Orzo when you need dinner in a hurry—you’ll be transported by each layer of flavor, with a bonus of quick cleanup. Red Lentil Falafel is a fun, family-friendly meal, and Stuffed Tomatoes with Lamb and Feta make a colorful spread for guests. 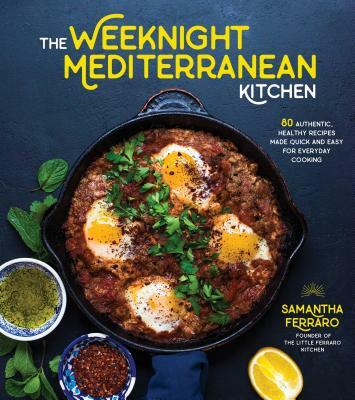 With so many choices of creative soups and salads, richly-spiced meats, healthy grains and indulgent desserts, cooking the Mediterranean way is a breeze even on your busiest weeknights. Samantha Ferraro is the founder of the food blog The Little Ferraro Kitchen. Her recipes have been featured in PBS Food, The Huffington Post, Los Angeles Times, Babble, Yummly and The Washington Post. She has been the Los Angeles Times Food Holiday Baking Winner. Samantha lives in Bellingham, Washington.